This Chinese New Year period saw the hottest weather on record, which wasn't good news at all. The lunar calendar began relatively early, starting on February 5 of the Gregorian calendar, that is the international calendar we're mostly using - the temperature would have been even higher had the traditional year started later this month, as it does most of the time. It was no fun at all going to Lau Fau Shan yesterday - the third day of Lunar New Year - only to be punished by 29.8 degrees Celsius heat. The anomaly should be strong enough to remind us of the broader issue of climate change that is a real threat. There is probably only one individual on this planet who doesn't think so, and this person goes by the name of Donald Trump. Scientists, including leading ones in the United States, have just confirmed the world had its fourth warmest average temperature on record in 2018. Worse still, planet Earth has been usually hot for five years at a stretch. While we in this generation may not feel the deadly impact of rising temperatures, the scorching consequences will be there for our future generations to bear. Something has to be done about it, and the quicker the better. Unfortunately, standing right in the middle of the crossroads is Trump. 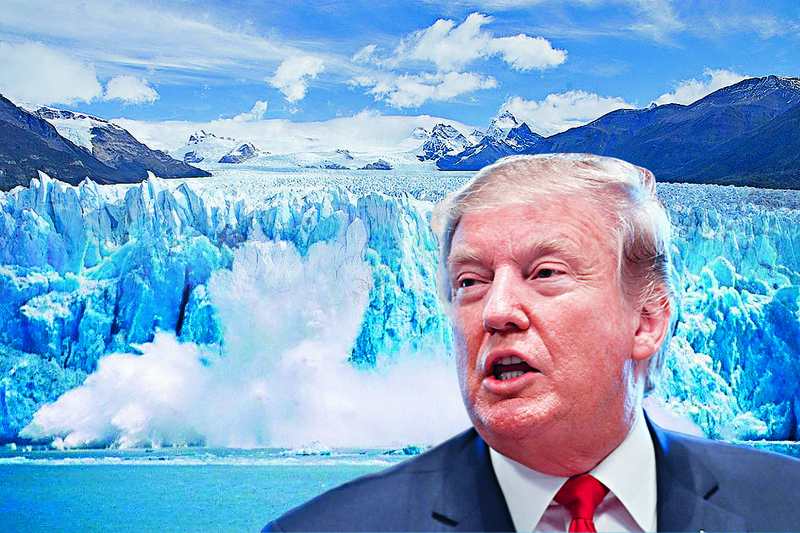 If climate change poses a threat to us all, the Trumpism that the US president represents is no less harmful for the world. It's basically eccentricity. So the American commander-in-chief ignored scientists' warnings with his blatant ignorance and pulled the world's second largest producer of greenhouse gases out of the Paris climate agreement - ditching his predecessor Barack Obama's policies to reduce carbon dioxide emissions rigorously. It's no accident that US emissions spiked in 2018 after three years of continuous decline. The surge was the biggest in eight years. As Trump and his advisers blamed India and China for polluting the atmosphere, they should blame themselves fiercely for the extreme cold and inferno heat that have been hitting Americans frequently in recent times. Trumpism is ignorant of climate change. So is it about the international order of cooperation that countries have taken years of efforts to put together since the end of World War II? Groups including the United Nations and World Trade Organizations were thus formed to set common standards and resolve differences by peaceful means. The real danger of Trumpism is that it distorts the understanding of common values. The slogan to make America great belies the true intent to make America first. There is a fundamental difference in between: while someone great is often respected, somebody bent on being the first is eccentric and seeks to dominate. The trade war Trump first initiated against the world, and later narrowed down to a one-on-one with China is a smokescreen to conceal the true motive to contain China, to prevent it from challenging America's number one position. Trumpism is twisting people's understanding of values from climate change to human rights and international trade in a way as dangerous as global warming.